Melanoma is the most serious form of skin cancer, even though it accounts for about one percent of all skin cancer types, it is responsible for a large majority of skin cancer deaths. Melanomas often resemble moles and some of them actually develop from moles. The majority of melanomas are black or brown, but they can also be skin-colored, pink, red, purple, blue or white. If melanoma is caught and treated early, it is almost always curable. However, if it is not, the cancer can advance and spread to other parts of the body, where it becomes hard to treat and can even be fatal. Myriad myPath® Melanoma can differentiate malignant melanoma from noncancerous moles to help improve treatment options for patients. The American Cancer Society estimates that there will be approximately 96,480 new melanoma cases diagnosed and almost 7,230 people are expected to die of the disease in 2019. The overall five-year survival rate for patients whose melanoma is detected early is about 97 percent in the U.S. The survival rate falls to 68 percent when the disease reaches the lymph nodes and 15 percent when it spreads to other organs. Skin Type: Melanoma is more than 20 times more common in Caucasians than in African Americans. Overall, the lifetime risk of getting melanoma is about 2.6% (1 in 38) for whites, 0.1% (1 in 1,000) for blacks, and 0.58% (1 in 172) for Hispanics. Regardless of their skin type, everyone should take precautions to protect themselves from UV exposure. UV Radiation Exposure: Whether it is from the sun or indoor tanning beds, UV radiation exposure is the most frequent and the most preventable risk factor for developing melanoma. Although one or more severe, blistering sunburns during childhood increases the risk, so does ongoing exposure over a lifetime. One bad sunburn before the age of 16 can actually double the lifetime risk of developing melanoma. Living and/or working in sunny climates or at high altitudes adds to this risk. The amount of radiation produced by a tanning bed is similar to the sun and, in some cases, might even be stronger. Studies have found a 75 percent increase in the risk of melanoma in individuals who have been exposed to UV radiation from indoor tanning. Even occasional use of tanning beds can triple the risk. Family History and Genetics: People who have a first-degree relative (parent, sibling or child) with melanoma are two to three times more likely to develop the disease than the general population. For those with many close family members with melanoma, the risk increases from 30 to 70 times. Approximately 10 percent of patients with melanoma have a family history of the disease. Genetic mutations have been found in 10 to 40 percent of families with a high rate of melanoma. However, many people who inherit a genetic susceptibility never develop melanoma. Individuals with these gene mutations may have 50+ common moles (small growths on the skin that are usually pink, tan or brown and have a distinct edge) or five atypical moles – a condition called dysplastic nevus syndrome. When this syndrome is inherited and there is a family history of melanoma, people are considered to have Familial Multiple Mole and Melanoma or FAMM and they are at very high risk of developing the disease. Other Risk Factors: Other risk factors for melanoma include a weakened or suppressed immune system as a result of having a different type of cancer, the AIDS virus or an organ transplant. In addition, coming into contact with cancer-causing chemicals such as arsenic, coal tar, creosote, pitch or radium may cause the disease. What Is myPath® Melanoma and How Can It Help Me? Occasionally, the current techniques do not allow doctors to definitively determine whether a mole on your skin is cancerous (melanoma) or not. The myPath Melanoma test can help doctors make this distinction by providing additional analysis of the mole at the genetic level. If a dermatopathologist orders myPath Melanoma, he or she will interpret the myPath Melanoma test result along with the information obtained by examining the mole under the microscope to provide a final diagnosis. In order to determine your risk of carrying gene mutations associated with hereditary melanoma, your healthcare professional may ask you about your personal and family cancer history. Knowing your potential risk for hereditary melanoma can help you and your healthcare professional make better, more informed decisions about your health, before the onset of cancer or before a second cancer has had a chance to develop. 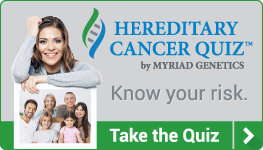 To help you assess whether you may benefit from hereditary cancer genetic testing, take the Myriad Hereditary Cancer Quiz. This quiz can help you get the information you need to discuss your risk of cancer with your healthcare professional and ask for further evaluation. 1. Cancer Facts and Figures 2016. American Cancer Society. http://www.cancer.org/acs/groups/content/@research/documents/document/acspc-047079.pdf. Accessed March 17, 2016. 3. Greene MH. The genetics of hereditary melanoma and nevi. 1998 update. Cancer 1999 86:2464-77. 4. Bishop DT, Demenais F, Goldstein AM, et al. Geographical variation in the penetrance of CDKN2A mutations for melanoma. J Natl Cancer Inst 2002;94(12):894-903. 5. Kefford RF, et al. Counseling and DNA testing for individuals perceived to be genetically predisposed to melanoma: a consensus statement of the Melanoma Genetics Consortium. J Clin Oncol. 1999;17(10):3245-51. 6. Vasen HF, Gruis NA, Frants RR, van Der Velden PA, Hille ET, Bergman W. Risk of developing pancreatic cancer in families with familial atypical multiple mole melanoma associated with a specific 19 deletion of p16 (p16-Leiden). Int J Cancer. 2000;87(6):809-811.